Silberra Selen toner is liquid concentrated toner and protecting solution designed for tray toning both baryta fiber based and RC based photo papers. Toning improves archival lifetime of your prints and enhances maximum density of the prints. Toning can be performed both on fresh prints and on those printed several years ago (we don't recommend toning any prints older than 5 years). To make stock toning solution dilute Silberra Selen toner concentrate with distilled water at 1+9 ratio; in order to intesify toning effect you can increase dilution up to 1+4 ratio. Dilution ratio affects not only intensity, but speed of toning also. We recommend using 1+9 ratio initially, which allows to increase concentration by simply adding some concentrate in case you'd like to get more intense toning. 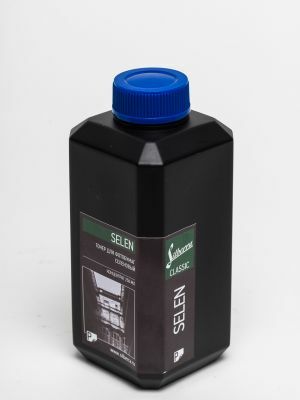 To prepare protective solution for your prints dilute Silberra Selen toner concentrate 1+19 with distilled water. Use toning solution in ventilated room, use gloves and apron to avoid skin contact. In case you find the scent of the chemical annoying enough, use respirator also. To reduce scent you may use transparent chemically inert plastic or glass cover to close the tray with Silberra Selen Toner. No special light needed to work with toning solution. You'll need up to three trays for toning/protecting your prints. One tray is filled with Silberra Selen stock solution, the second one is used for washing the print. The third tray is optional and shall be used for preliminary wetting of the old prints in case you decide to work with that material. Toning solution temperature shall be 20C - 22C; lower/higher temperature may result in weakening/fastening the toning effect. Maximum toning temperature shall be no higher than 25C to avoid print damage. Minimum recommended time for toning is about 4-5 minutes; the longer you keep the print in toning solution the more intense shall be the tone of the print. Agitate the tray by gently rocking it from side to side. Final toning time is up to 30 minutes, depending on the dilution and your personal visual preferences. In order to control the toning process we recommend to make two prints from the same negative and reserve one for the reference. We do not recommend observing the print in toning solution continuously also, as it prevents you from noticing slight changes in color while toning process is underway; we'd rather recommend taking a look at the print approximately once per minute to get the tone change in a right way. When using Silberra Selen Toner for print protection (at 1+19 dilution) immersion time of 4 minutes is enough for working solution to form the protective layer over the print. All the rest of the instructions are the same as for toning the print. In case the print you want to tone/protect is the old one, you have to wet it prior to toning/protecting. Use the third tray with distilled water; wetting time shall be no less than 5 minutes. When print gets the tone which satisfies you, it shall be removed from toning solution (use clear tweezers or wear protective gloves to remove the print by hands) and placed into slowly running water in the second tray for washing. Washing time is approximately 20 minutes at 18C - 22C. 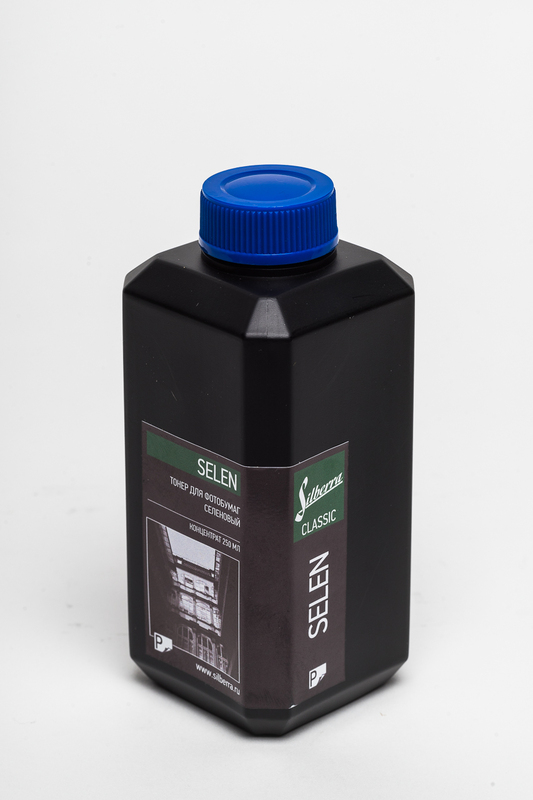 Keep Silberra Selen Toner in a cool, dry and dark place. Keep away from children. All the solutions should be stored in tightly sealed bottles, with low internal air volume. Silberra Selen Toner may be stored in its original sealed bottle for up to 12 months; after opening the bottle, the Toner will remain useable for no more than 10 months. Silberra Selen Toner working solution doesn't have a guaranteed shelf life and must be used within 1-2 days after the date of preparation. 1 Litre of Silberra Selen Toner working solution is enough to process 0,05 Sq.m. of photo paper. Silberra auxiliary solutions must be disposed of in accordance with the rules and regulations of the country they are used in. Concentrated photographic solutions of any kind could be toxic and may harm the environment unless disposed in appropriate manner. Silberra recommends to use special disposal services provided by correspondingly licensed organizations which are eligible for photographic chemistry recycling/disposal. All rights reserved. Copying the contents of the web-site without written permisson of the owner of web-site is prohibited.